ASEAN at 50: What does the future hold for the region? You are here: Home | ASEAN | ASEAN at 50: What does the future hold for the region? The year 2017 sees the Association of Southeast Asian Nations (ASEAN) celebrate its 50th anniversary. And there is indeed much to celebrate. But just as importantly, the anniversary is also a moment to think about the future of the region and what lies ahead. The World Economic Forum on ASEAN 2017 in Phnom Penh will be just such a moment for reflection. The theme of the summit is Youth, Technology and Growth: Securing ASEAN’s Demographic and Digital Dividends. Each of these ideas holds important questions for the future of the region. Economic growth is critical as the engine that drives rising incomes and prosperity. ASEAN as a whole has a good record in recent years, growing by around 5% a year, and powering the creation of a giant middle class. At the start of 2016, the 10 economies of ASEAN were collectively the seventh largest economy in the world. By the start of 2017, that rank had improved to sixth, and by 2020 it will be fifth. But, as impressive as this is, ASEAN could and should be growing much more quickly. A realistic aspiration is to grow at 7%. The difference between 5% and 7% may seem small, but the impact would be felt deeply. At 5%, ASEAN doubles its income every 15 years. At 7%, it doubles every 10 years. To achieve 7%, the region must focus on many individual national issues, such as infrastructure and education. But there is also an important regional dimension too. The region would benefit significantly from pushing forward the implementation of the ASEAN Economic Community (AEC). Much work remains before the AEC fulfils its promise of being a genuine single market and integrated production base. Without full realization of the AEC, local businesses will struggle to reach scale and be globally competitive, and consumers will pay more for products and services. China and India, with their giant domestic scale, will continue to outperform. Just as critical as the quantity of growth is the quality of growth. Sadly, inequality is rising across many ASEAN nations. Not everyone is benefitting equally. The World Economic Forum’s Inclusive Growth and Development Report 2017, released in January this year, looks closely at the policy levers governments can deploy to ensure more equitable outcomes. The answers go well beyond redistribution through tax. Indeed, redistribution should really be a last resort. Youth is a second essential consideration for the region. The 630 million citizens of ASEAN are still extremely young (though not universally – Singapore and Thailand are already ageing). Having a young and growing population creates a golden moment in a country’s economic development journey, promising a powerful demographic dividend. As the working-age population grows in number, it will boost the region’s spending, but also increase its savings and hence its capacity to invest. And yet, nothing is guaranteed, and the region’s demographic dividend is time-limited: by 2025, most countries in ASEAN will see their populations start to age. Governments and policy-makers must ensure they pursue the right policies today to guarantee their demographic dividend is realized. They must think deeply about education and how best to prepare workers for the jobs of the future. They must identify areas of inter-generational tension, such as the environment and the funding of pensions and healthcare. Growth today cannot come at the expense of future generations. How should governments plan long-term for sustainable finances and a sustainable environment? The third part of our summit theme is technology. ASEAN came into being in 1967, just two years before the internet was created. As such, the impressive rise of ASEAN has coincided perfectly with the Third Industrial Revolution, driven by computers and communications. But today, as ASEAN celebrates its 50th anniversary, the world stands on the cusp of the Fourth Industrial Revolution, driven by technologies such as artificial intelligence, machine learning, autonomous vehicles, ubiquitous mobile internet, and accelerating progress in genetics, materials science, and ultra-cheap automation. 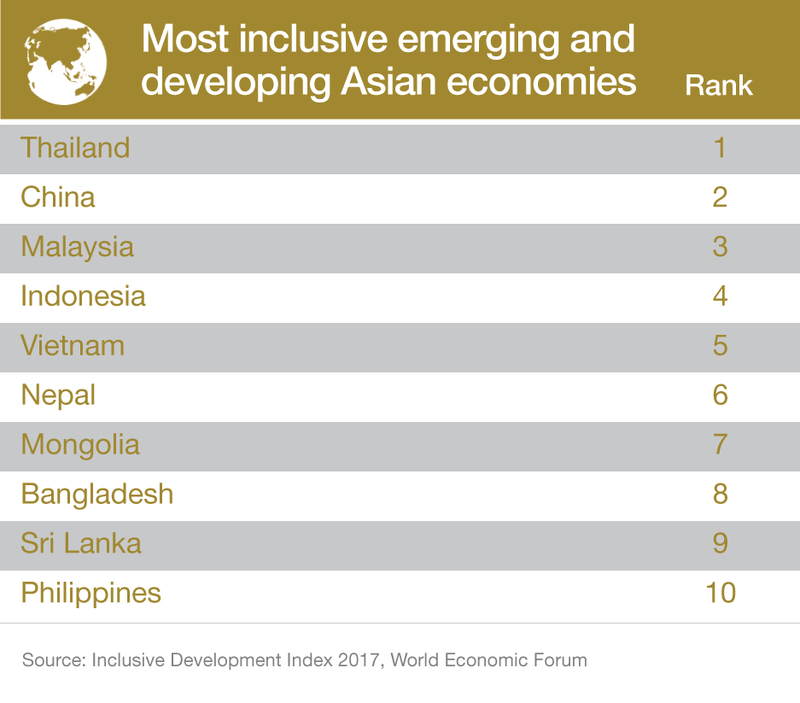 If ASEAN is to prosper for another 50 years, it must tackle difficult questions about how to navigate the accelerating pace of technological change and digital disruption. On the one hand, the Fourth Industrial Revolution could bring huge benefit to the region, driving financial inclusion, access to affordable healthcare, new forms of education, and the creation of new companies and service sector jobs. ASEAN is today the fastest growing internet market in the world. A recent report from Google and Temasek calculates that the region’s online population is expanding by 124,000 new users every day – and will continue at this pace for the next five years. Equally, however, technology could cause many challenges. As robots become ever cheaper, can manufacturing still be a route to job creation? How should the region teach IT and technology skills and create a vibrant innovation ecosystem? How can governments build the right enabling environment, and a connected regional digital economy, that enables the Fourth Industrial Revolution to thrive? Just as important is the issue of transparency. Digital technologies help to expose corruption and wrong-doing, which could raise social frustration and disruption. But these technologies also offer exciting possibilities for removing bad behaviour. With more than 750 leaders from business, government, academia and civil society, the Forum’s summit in Cambodia will be a platform not only for debating these big questions, but importantly for brainstorming solutions and helping people to take action. By Justin Wood.